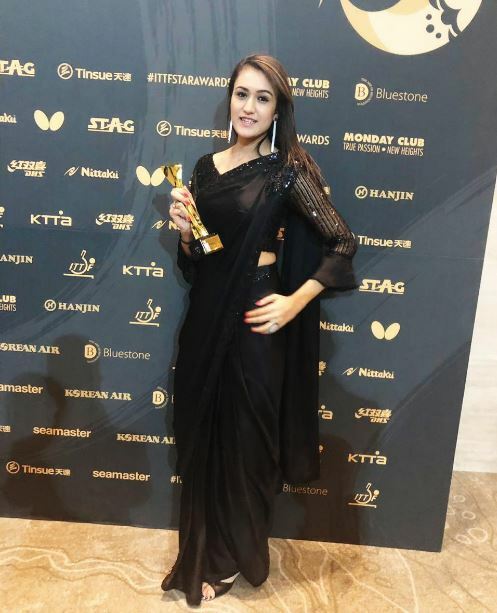 Kolkata: It had turned out to be a breakthrough year for India's most celebrated woman paddler, Manika Batra, as she bagged the 2018 Breakthrough Star award at a glittering function at Incheon tonight. Table Tennis Federation of India (TTFI) Secretary General MP Singh said in a statement. "I couldn't have imagined at the beginning of the year. The way it has culminated has made me feel happy and more responsible. I have to thank many for such a wonderful opportunity,? said Manika, speaking from Incheon." I really want to thank the International Table Tennis Federation for acknowledging my efforts throughout the year. For me personally, it has been one of the most eventful years of my sporting career so far and this is a just reward for my hard work and training. I would like to thank the Table Tennis Federation of India, Sports Authority of India and the Sports Ministry and, above all, my coach Sandeep Sir and my physio Subodh Sir without whom this wouldn't have been possible. My thanks are due to my department Indian Oil Corporation Limited for their continuous support. I would like to thank my family who supported me and been there as my pillar of strength,? said Manika, recalling the efforts each one of them had put in to shape her career. India won an astounding eight medals at the CWG in Gold Coast including three gold medals. Besides, India also won their first Asian Games medals in the Men's Team and mixed doubles at Jakarta.The Italian, thus, became only the fourth coach to take home the Star Coach award. Earlier, Pedro Rufino, Liu Guoliang and J?rg Rosskopf were bestowed with the honour. I can't thank enough ITTF for the award. But I wouldn't have been here without the fantastic bunch of players in both sections which TTFI provided me. They were really wonderful and responded well. I must thank all those concerned in India, including SAI, for the wonderful opportunity to serve the cause of Indian table tennis,? said Massimo. Dushyant Chautala, president of TTFI, in a congratulatory message to Manika Batra said, ?she richly deserved the award,adding, Manika proved herself in both the Games that a star was born. Secretary-General M.P. Singh, in his congratulatory message to both Manika and Massimo Costantini, said: ?It was a wonderful year for Indian table tennis and Manika epitomized it with her performances. She was the star performer and deserves all the accolades. And Massimo was a worthy coach who made it all possible and I wish him all the success. ?